Manny Gonzalez is not an MLB staff umpire, and he had only umped 53 games at the highest level through last season. (He doesn't even have an official profile.) Indeed, he's been bouncing around the minors since the early '90s, and it appears he may never get the permanent call to The Show if he keeps making maddeningly dumb calls like this one, from tonight in Chicago. Here's a mini-Better Know An Umpire capsule for Gonzalez, since it appears this could be our last good chance to familiarize ourselves with his work. Notable alleged blown calls: Mets-Cubs, June 26, 2012. 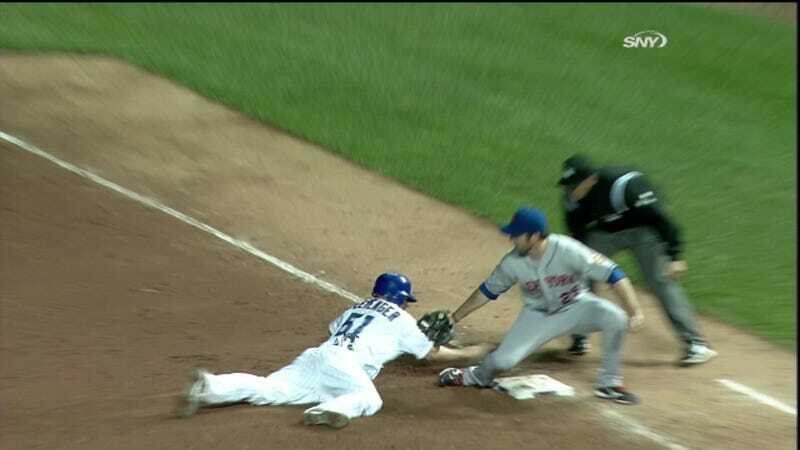 Claim to fame: Making am inconceivable safe call on the Cubs' Steve Clevenger, despite being perfectly positioned. [In 2010] Gonzalez became the first Venezuelan to umpire a major league game. ... Gonzalez first gained umpiring experience as a teenager in the Miami area. Among his colleagues: Laz Diaz.